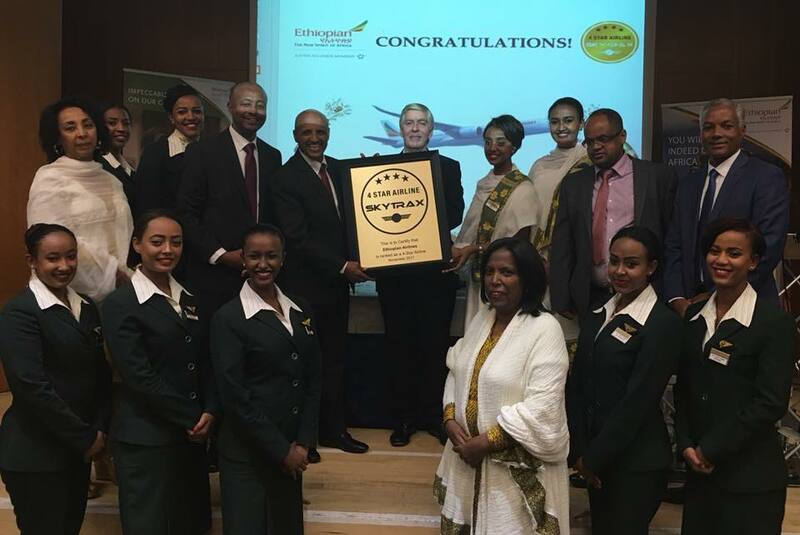 Africa’s largest airline group, Ethiopian Airlines, was awarded Skytrax 4-Star certification at a special ceremony, hosted by the Ethiopian Embassy, in London on November 8, 2017. Skytrax, the most prestigious international air transport standards and quality rating organization, operates certified airline rating – a global airline standards ranking program. Ratings are determined through direct and professional auditing and analysis of the quality of service standards. Ethiopian Airlines now joins the likes of British Airways, Qantas and Emirates as a global 4-star player in the international airline arena. While receiving the certificate, Group CEO Ethiopian Airlines, Mr. Tewolde GebreMariam, remarked, “The 4 Star recognition by Skytrax is a significant milestone in the long history of Ethiopian Airlines. As a customer focused airline, it is extremely gratifying that our hard work to ensure high level of customer satisfaction at all times through a consistent delivery of global standard product and superior level of service has borne fruit. Ethiopian Airlines is a multi-award-winning airline and has previously received Skytrax World Airline Award for Best Airline Staff in Africa, two times and earlier in 2017 Ethiopian received Skytrax World Airline Award for Best Airline in Africa. Ethiopian is currently implementing a 15-year strategic plan called Vision 2025 that will see it become the leading aviation group in Africa with seven business centers: Ethiopian Domestic and Regional Airline; Ethiopian International Passenger Airline; Ethiopian Cargo; Ethiopian MRO; Ethiopian Aviation Academy; Ethiopian In-flight Catering Services; and Ethiopian Ground Service. Ethiopian is a multi-award-winning airline registering an average growth of 25% in the past seven years.